I cursed myself for years for not reading The Infernal Devices series despite the fact that the first two books were sitting on my shelf. It turns out that my procrastination worked in my favor. I was able to read Clockwork Angel, Clockwork Prince, and Clockwork Princess all in a row. And I think we can all agree that that makes a series much more powerful. I fell in love with The Infernal Devices with the second book, Clockwork Prince. Clockwork Princess increased my love for the series and also touched me in a way that no other Cassandra Clare book has. I just re-read the Epilogue before starting this review and cried all over again. There's so much going on in Clockwork Princess. Off the top of my head, I can think of about eight subplots and I think there are actually more than that. The story switches rapidly between each plot arc and between different characters' points of view. This would have (and was) been confusing in the first book of a series, but now I'm sufficiently familiar with the characters and the overarching story that it's a welcome writing technique. I love getting to know every facet of a paranormal world and seeing the story through the eyes of different characters. This is one area where Cassandra surpasses the Harry Potter books which could have been a much richer series if we had seen beyond Harry's eyes (not that I'm knocking my favorite books of all time). With all that's going on, you'd think the pacing in Clockwork Princess is very quick. And it is. If there's a story line that you don't like, it will be over soon. Yet at the same time, the book floundered in the middle. While all of it was interesting, there was a good 50-100 pages where I impatiently wondered when anything was actually going to happen. I continue to love both Will and Jem. The love triangle is a huge part of The Infernal Devices. And I think it will please even those who despise love triangles. Because it's different. In a typical love triangle, the girl loves one guy more. The third angle is hopelessly in love with a girl who will never end up with him. And the two guys are willing to kill each other out of jealousy. Not the case here. Tessa loves Jem and Will equally. It's as Magnus says, "Most people are lucky to have even one great love in their life. You have found two." Tessa's love for both boys doesn't feel weird or creepy. It's sweet and understandable, given the characters' differences. And Will and Jem aren't at each other's throats in a jealous rage. They are parabatai - best friends, partners, two parts of one soul. As much as each character loves Tessa, they also would be happy if Tessa was with the other person because the two boys care for each other that much. It's a very odd dichotomy that feels beautiful and fresh. The epic battle against Mortmain as well as the battle for Charlotte to maintain power over the Institute forms the basis of the plot. But that's not what I'll remember about this story or this series. I remember the epic love between Tessa, Jem, and Will as well as the love between the smaller characters. Cassandra has done an incredible job at creating three dimensional characters...not just two or three people but more than ten. This is much more of a character driven series than it is an action series. My favorite part of Clockwork Princess was the Epilogue. I've heard some people didn't like it, but to me, it was perfection. That's the part of the book that I will read over and over again. It pulled the whole story together in a manner that was both satisfying and logical in the framework of the Shadowhunter world. The Epilogue made the series for me. 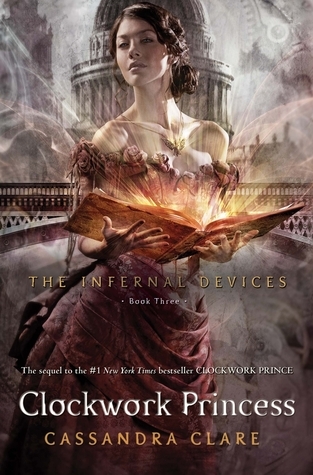 Clockwork Princess and the whole Infernal Devices series show how much Cassandra has grown since City of Bones. Not that City of Bones was a poorly written book - I loved it - but Clockwork Princess shows how Cassandra is capable of putting together a compelling story with a multitude of richly described, unforgettable characters. It makes me wonder what the early Mortal Instruments books could be like if she re-wrote them with her current writing skills. I simply cannot recommend Clockwork Princess and the entire Infernal Devices series highly enough. Maybe I need to try this pre-series series again...I read one of the books, enjoyed it but didn't continue. However, after your series love here, I think I need to revisit! I haven't picked up the last book to this series. I may have read too many spoilers about it that I ended up not wanting to read it. I'm glad you loved these books! I love when you can read an entire series in a row. I'm usually not patient enough. In fact, I've read the first book in both of Clare's series! Great review! GAH! I need to finish this series ASAP. I loved your review. I really need to finish this series. Don't like TMI, but I enjoy this one. I, too, loved this book and the epilogue. It's one of the few series that when I finished it I wanted to open it and reread it again. I know this is a series that I'll revisit often. I loved the characters and the setting. I bought this book the week it came out and still haven't read it. I'm making it a goal of mine to attempt to read this this weekend. I keep seeing spoilers all over Tumblr and Twitter so I need to get on it ! Oh yay, I'm so happy to hear that you loved this series so much because it's one of my favourites too! I completely agree with every point you make, as well. I usually HATE love triangles because they have a tendency of turning the characters into jerk faces, but this was one love triangle in which every party involved has the utmost respect for every other party and no one comes off looking bad. I would love to read about love triangles if they were always so well written as this! Characters are of course the thing that CC excels at above all. I just have such fondness for all her characters! They are so well done (and I also agree that her writing has gotten so much better since she wrote City of Bones). And finally, the epilogue: it pleases me so much that you felt it was perfection because I felt the same and it makes me sad when people say that it was such a terrible ending. I just couldn't think of a more fitting ending for the characters. It was so poignant and yet so pleasing. Anyways, obviously I thought this was an excellent review - good job!! How can you not love the epilogue! I thought it was beautiful. And can't wait to see what she does next. And by that I don't necessarily mean the last of The Mortal Instrument books, but the third series about Jem's family.